“Lazy hands make a man poor, but diligent hands bring wealth,” reads the card that Elijah Jeremiah “LJ” Barber always carries in his wallet. Driven by this proverb, the freshman with the sharp suits quickly has evolved into a shining star in the SIU College of Business. Whether it’s officiating intramural basketball games in the Student Recreation Center, selling cupcakes on behalf of the registered student organization Ascend to fellow business students in the entrance of Rehn Hall or networking with alumni as part of the College of Business mentor program, the versatile finance major from White Hall, Illinois, wasted no time getting immersed in the culture of Carbondale and the SIU campus. With his first year as a Saluki winding down, Barber recounted the highs and lows of college life, discussed benefits and challenges of being a first-generation student, and revealed his reasons for his distinct fashion style. He also revealed which superpower he would like to possess. Barber said he usually tries to read one book per week, and he usually can be found in Rehn Hall or Morris Library with a book in his hand. Other times, though, one can catch him networking with individuals. That’s just one of the many pieces of practical advice he took away from the talks he had with the former director of minority affairs, Mike Haywood, who retired in December. It was one of those inspirational conversations with Haywood that led to a change of heart for Barber, who originally planned to study at Illinois State University. But it wasn’t until he walked into Rehn Hall, home to the College of Business, that he decided to become a Saluki. “I literally ran into Mr. Haywood and had a 15-minute conversation that kind of sealed the deal for me and made me come to SIU,” Barber said. Fast-forward to this April, and the freshman said he hasn’t regretted his decision, despite having faced a few challenges that also confront other incoming college students. This spring, Barber said he cut his course load back to five classes and four organizations, primarily to free up time to attend conferences and listen to people speak. As a first-generation student, he also acknowledged a lack of discipline as another difficulty he encountered. “You have to remind yourself to go to class, do your homework assignments and whatever else is required for each class,” Barber said. In hindsight, Barber said he considers his struggles with having to learn how to efficiently manage his time as one of the perks of being a first-generation student. The latter, in particular, is Barber’s driving force: the desire to stand out from the rest of the crowd. It also helps explain his fancy attire. With his consistently positive attitude, the freshman finance major has taken the College of Business by storm. 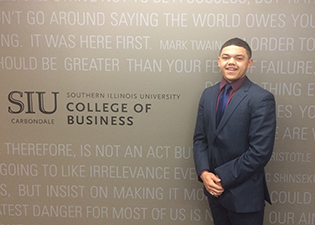 With summer looming, Barber’s next goal is an internship with Northwestern Mutual while working part time with mentors to learn more about investments and the language of money. His career goal is to become an entrepreneur and an investor, and to own several businesses for a good cause. “The whole idea of making money is to make a difference and to give back,” he said. The College of Business looks forward to being part of Barber’s journey to success. Keep up the hard work, LJ!